Dolpo region lies between the Tibetan highland and the Mountains of Dhaulagiri ranges. Until 1989 the entire district was closed to trekkers. After 1989 the southern part of Dolpo was opened to organized trekking groups and now it is open as restricted area trekking which means the special permit is needed to do the trek. In essence, Beni Upper Dolpo trek is also a restricted area trekking. Likewise, this trek is also one of the off the beaten path trek in Nepal. Beni upper Dolpo trek via Dhorpatan lets you explore one of the most gorgeous and pristine areas in the world- the Dolpo region. A few years back, the Dolpo region was very untouched and least trodden land that had not been seen by outsiders for so many centuries. Dolpo region lies towards the northern side of Nepal. Now the region is one of the most sought after trekking trails for people coming to Nepal for trekking. Still, Dolpo retains its past centuries-old traditions and cultures. The people of Dolpo region still maintain their original lifestyles and it seems like the time has stopped here for the people of this region. Modern lifestyles are far beyond imagination in the Dolpo region and one can feel the simplicity and the ingenuity of the native people in Dolpa. This is also a mystic land and Thinley’s Himalayan Movie “Caravan” had illustrated it already. Beni Upper Dolpo Trek via Dhorpatan is categorized as a difficult trek. Likewise, it is also the off the beaten path trek and you’ll have to hike for around 6-7 hours, cross steep, hilly terrain and occasional high passes of up to 5500 m. You are probably to be in an exceedingly remote atmosphere with extreme weather on some days. You will even be facing high-altitude air with low levels of oxygen. Therefore, previous trekking expertise, good condition and a positive perspective are essential. Beni Upper Dolpo trek via Dhorpatan starts from Myagdi district headquarter Beni. From Beni, the trail passes the south, along with the Babiyachaur village, Ratodunga, Muna, Jaljala and finally to the Dhorpatan village. As a matter of fact, Dhorpatan Hunting reserve is only hunting reserve in Nepal and is very popular for abundant blue sheep hunting. However, a special hunting permit is required. From Dhorpatan the trail heads to a western part of Nepal. Following wilderness trail throughout Phagune pass 4062 meters to Pelma, Dhule, Sengkhola through trans Himalayan ancient caravan path. Further, Hiking to the northern pastureland Known as Jangla and finally descending down for a while you’ll reach at ‘Shahartara’ a gorgeous Magar Village. Thereafter, beyond the ‘Ticherong ‘ area you’ll further continue your journey towards the north beside the Tarap River along the Laina Odar, Pivo cave, Sisol and finally, reach ‘Dho Tarap valley’. As a matter of fact, Dho Tarap is the highest human settlement and trade point of Upper Dolpo. At the end of the Tarap valley, you’ll turn to the west crossing two high passes Numala pass (5360m) and Bagala Pass (5070m). You’ll get to caters amazement vistas and spectacular scenic realms before descend all the way down to the Rigmo Bon village and greenish blue Shey Phoksundo Lake. Now at Phoksundo, you’ll have a day for exploring the village and visit Bon monastery located at the corner of Shey Phoksundo Lake. After that, Trekking for around two days along the Suligard River, along with the Rechi, Chhepka, Kageni, you’ll reach Suligad. Finally, you’ll be Crossing the suspension bridge and hike for an hour along the bank of Bheri River up to Kalagauda. Eventually, a short hike upwards will take you to Jhupal from where you’ll fly back to Nepalgunj and then to Kathmandu. Our Beni upper Dolpo trek via Dhorpatan itinerary is intended for beginner trekkers who are in healthiness with average good condition. The ample distance coated between daily itineraries, the steady gain of altitude and separate rest days ensures that we have a tendency to properly acclimatize to totally relish your trek to the high passes in Dolpo region and other highlands. You can customize the itinerary as per your criteria following the precautions. Today just after your breakfast is over, you’ll begin a guided tour to many of the most historical and religious attractions around Kathmandu valley, which also are listed as United Nations World Heritage sites. You’ll visit the historic Durbar Square, the sacred Hindu temple of Pashupatinath, the famous 'Monkey Temple' (Swayambhunath) and Buddhist shrine (Bouddhanath), which is also one of the largest stupas in the world. At noon, you’ll get your equipment checked by our trekking leader, get introduced to fellow participants, and discuss Beni Upper Dolpo trek details at our office. Overnight in Kathmandu. 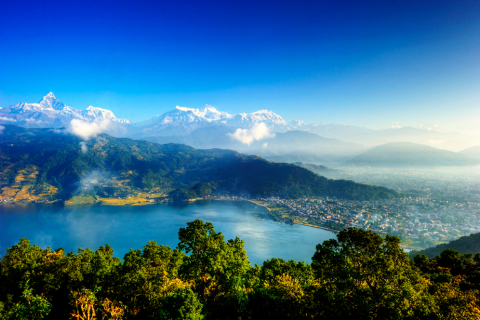 Day 3: Drive or fly to Pokhara, get some rest and walk around Lakeside. One the third day, you will leave for Pokhara either by bus or by flight. It takes about 6 hours to reach Pokhara by bus. Likewise, by flight, you will reach Pokhara in 30 minutes. You will take rest and explore the beauty of Lakeside, Pokhara in the evening. Finally, you will spend the night in Hotel. Your journey starts with a jeep ride in the morning. The road follows the path till Nayapul as in Ghorepani Poonhill trek with the panoramic view of Annapurna South, Machhapuchre, lush green hills, terraced fields and villages. You’ll then drive through Kusma and along the banks of the Kaligandaki River till you reach Beni. Beni (830m) is a small town lies on a plateau between the Kaligandaki river and Myagdi Khola. Your Beni upper Dolpo trek via Dhorpatan starts at the southern end of Beni. You’ll further follow the river (Myagdi Khola), which starts from the Dhaulagiri glacier till you reach Tatopani- The hot spring. It is a great idea to take a dip and relax at the hot spring with a chilled beer! you’ll stay overnight at Tatopani. Today, you’ll cross the suspension bridge over Myagdi Khola and ascend up a rocky path dug into the cliff just over the river. And then the trail follows ascends and descends through the village and forest. Likewise, the majority of inhabitants in this area belong to the Magar, Chhetri and few other ethnic communities. You’ll camp at Ratodunga. Today, you’ll hike through a flat trail passing the villages of Takum and Sibang. Just after Sibang , you’ll ascend up to the small settlement of Mattim. Finally, from a crest of Mattim you’ll descend down and reach Muna. Today on your trek from Muna to Jaljala La (3390m.) you’ll follow trail via Lumsum (2100m.) and Moreni (2670m.). Firstly, you’ll make a steep climb, passing through oak and rhododendron forests to reach Lumsum. The trail offers you the spectacular views of Himalayan peaks like Dhaulagiri, Mana Pathi and other unnamed peaks. While hiking past the Moreni village you’ll see a glimpse of Tibetan lifestyle and culture as most people here have Tibetan roots. After Moreni, you’ll make a steep descent and finally reach the settlement at Jaljala Jangla. As a matter of fact, Jaljala is an alpine settlement on top of a ridge and is also a vantage viewpoint. This point offers the breathtaking view of Mountains in Dhaulagiri ranges. Likewise, this is a perfect camping area. It is believed that Jangla La is where the valley of fragrant water starts. An ancient kingdom of Tichrong is known as fragrant water valley. Today you’ll trek from Jaljala La to Dhorpatan (2870m) via Gurjakot (3070m). The path is vertically steep till Gurjakot and then it moves through flat land all the way to Dhorpatan. Gurjakot lets you immerse into the Tibetan culture since the people of this region follows ancient Tibetan Buddhism. The trek gets more interesting as we walk past the chortens and Mani walls, which are symbolic to Tibetan Buddhism and the culture of the area. As a matter of fact, Dhorpatan Hunting reserve is only hunting reserve in Nepal and is very popular for abundant blue sheep hunting. However, a special hunting permit is required. Shortly after leaving Dhorpatan, you’ll ascend uphill to Phagune Pass. During your trek, you’ll pass grasslands and sparse forests. Phagune Pass is surrounded by green hills and you can see the distant mountain top villages. you’ll camp for the night at a grassy campsite. Today you’ll trek through a steep trail that goes down past some beautiful villages, terraced fields and a suspension bridge over Pelma Khola (stream). As you cross the bridge you’ll make a steady ascent up through terraces and local villages all the way to Takur. While heading towards Pelma you’ll cross the wooden bridge over the Pelma river and hike ahead. Actually, the most notable part of this trek is because of terraced farms and small settlements along the routes. Pelma is just another village like the many others dotting the hillside. Today, you’ll trek from Pelma to Dhule (3300m) crossing Yamakhar (2480m) and Gorba Khola (2930m). Just after crossing Pelma Khola the path ascends up steeply all the way to Dhule. Dhule is a beautiful mountain village where you’ll camp for the night. Today, Leaving Dhule you’ll trek via Nautale Bhanjyang (3961m) all the way to Seng Khola. The part of the trekking path today follows past dense forest with vegetations such as rhododendron, pine and juniper. After reaching Nautale Bhanjyang at the altitude of 3961m you’ll get to see the beautiful view of Mountain peaks in Dhaulagiri ranges. Finally, a two hour ascend will take you to Seng Khola village. Overnight at Seng Khola. Firstly the trek path takes you from Seng Khola to Purpang (4050m) following a steep and rocky trek route. Before reaching Purpang you’ll cross Panidal Pass at an altitude of 4412m. Panidal pass offers you the mesmerizing view of Dhaulagiri range, Kantagaton Himal, Nurbukang Himal and some other unnamed peaks. Finally on reaching Purpang which is an open rocky grassland surrounded by beautiful mountains you’ll hike towards Sahartara (2730m) through the trail which is steep passing through rocky terrain. Moreover, Sahar Tara is popular for Yarchagumba harvesting. Overnight at Sahartara. Today, you’ll spend a day for acclimatization on Sahartara. Likewise, you’ll spend some leisurely hours bathing in the hot spring to comfort your tired muscles. Today, from Sahartara you’ll follow a path along the banks of the river until you reach a large and green valley. Moreover, trekking forward from the village of Khani gaon to Lahini you might have some chance of meeting the famous musk deer, bounding away in the midst of juniper and pine forest. Overnight in Lahini. Today, From Lahini the trekking path will be narrower and adventurous as you hike through areas that are prone to landslide and avalanches. You’ll set up camp at Nawarpani lying in a grassy area. Today, your day will be one of the most significant milestones of Beni Upper Dolpo trek as it is a difficult and dangerous part of the trek. The valley starts getting narrower from there. On this path, you’ll approach some deep gorges and cross innumerable small bridge likewise path carved out of a rocky cliff side. Finally, following such an adventurous trek path you’ll reach Dho Tarap. You’ll spend today resting and strolling in the village of Dho Tarap a small village surrounded by an irregular stone wall. As a matter of fact, Dho Tarap is the highest human settlement and trade point of Upper Dolpo. Your hike today will help you get acquainted with the local culture of the area. At Dho, concerning forty homes are divided into three clusters and in-built a haphazard method inhabited by few Tibetans and principally Magars who are a hill tribe of Nepal. While here, you are able to visit a Buddhist Gompa that is nearest to your camping site or you’ll have a tendency to embark upon a 40-minute walk and visit a Bon Po Gompa. Overnight in Dho Tarap. After spending the rest day and visiting all the gompas and Chorten in Tarap valley you’ll take a path that ascends up through grassy meadows filled with wildflowers. Finally, you’ll reach to Numala base camp. From the base camp, you’ll get a gorgeous view of the distant Tibetan mountains and the upper Tarap valley. Today you’ll be crossing the Numala Pass at an altitude of 5309m. From the pass, you’ll descend towards Poyon Khola. You’ll finally reach the Bagala Base Camp which is surrounded by big glaciers and blade-shaped rock cliffs. You’ll stop for the night at Pelungtang, a village surrounded by hills that has temporary houses, yak pastures and terraces. From this point, you’ll have your first glimpse of Topo Peak (4900m). The Norbu Kang Himal sparkles brightly in the background. Today, you’ll make your way to Yak Kharka crossing Bagala Pass at an altitude of 5169m. The vantage point at the top of the pass will offer you an amazing view of the massive Kanjiroba Massif. After Baga La, the path turns gently down all the way to Yak Kharka. Yak Kharka literally means, the grazing place of Yaks in the native language. Today, your trek to Shey Phoksundo Lake (3600m) via Ringmo village (3641m) might take for about seven hours. Ringmo is a small village mostly inhabited by the Gurung and Thakuri communities. You’ll move along the flat land passing through pine forests, grassland, terraces, hills and villages. Shortly, after some time Phoksundo Lake starts to appear before your sight with all its glory. Before you reach the final destination of the day, you’ll have to cross a bridge made of wood, resembling wooden bridges of medieval Europe. As a matter of fact, Shey Phoksundo Lake is the deepest lake of Nepal. Likewise, it is also the deepest lake at an altitude of 3600m in the world. The bank of Phoksundo lake hosts a village which is quite rich culturally. 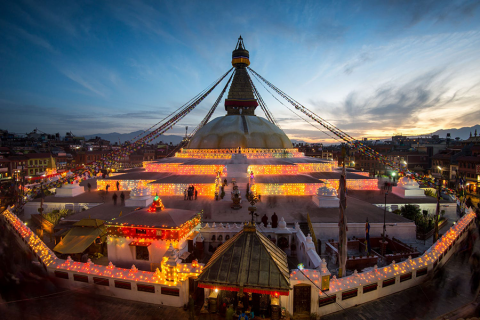 You can immerse in native culture and tradition and you can understand more of Tibetan Buddhist culture and its practices that are unique to the mountainous regions of Nepal and some parts of Tibet, as you will visit small chortens and monasteries. Today you’ll explore the area around the mesmerizing Phoksundo Lake. The lake is most notable for turquoise appearance. Moreover, Ringmo village, a typical Tibetan village is scenically settled in the folds of this area. Phoksundo is also home to many gorgeous glaciers found around the lake area. 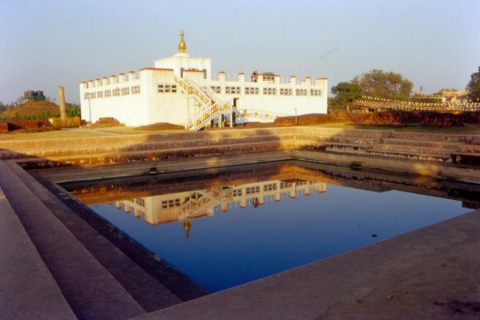 There are many monasteries (Gompas) and Bon-Po religious sites and you can spend your time visiting some of these sites. Shey Gompa is one of the oldest Monastery in all the Himalayan region. Likewise, it is believed to date back to the 11th century. Thashung Gompa, one of the popular Gompa located near Phoksundo Lake was supposed to be built about 900 years ago. After an interesting visit to the beautiful sights of the Phoksundo area and Ringmo Village today, you’ll leave Phoksundo and start your journey towards Chhepka. Today, you’ll start descending down through the Sulighat River gorge. Firstly, the trek path is steep and difficult to hike for about 4 hours. Likewise, the path is also rocky and not well maintained. On the way, you’ll pass Gurung and Tibetan villages. Trek from Chhepka to Juphal takes for about five hours of trek. You’ll trek along a gentle climb until you reach Raktang. On the path, you’ll come across forests covered by pine, oak, juniper, rhododendron, bamboo and other natural vegetation which is rich in wildlife. From Raktang, you’ll descend down steeply and steadily for some hours till you reach flat land. En route you’ll cross various terraced fields, villages rich in Highland culture, check posts and grasslands at Sulighat. Likewise, you can also visit Dunai, the headquarters of Dolpo (time permitting). This little town has quite a large settlement and plenty of tea houses and a few government offices. You’ll trek slightly flat land for a few more hours to reach Juphal, your final stop where the trek ends. Today You’ll have one and a half hour scenic flight from Jhupal to Nepalgunj and then to Kathmandu. Since you’ll have different flight schedule so you need to stay some time at Nepalgunj airport for the connecting flight to Kathmandu. you’ll reach Kathmandu in the afternoon. You can enjoy the leisure time dwelling around Thamel and Newroad in Kathmandu. Today, you’ll spend your day visiting places around Kathmandu and do some last minute memento shopping for you and your loved ones back Home.